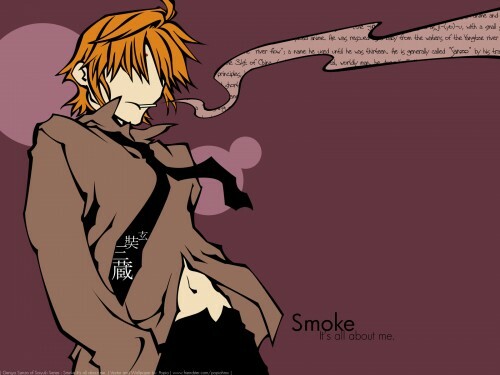 Saiyuki Wallpaper: Smoke - It's all about me. Minitokyo »	Saiyuki Wallpapers » Saiyuki Wallpaper: Smoke - It's all about me. Okay, this a Saiyuki paper featuring a ragged off Sanzo smoking his lungs out.. (haha...) He always looked blank and thinking of something... So I tried to make him look moody and emo as usual from a scan in AP... The cigar is his symbol and everything of him is sputted out into the smokes... (desciption from wikipedia!) Well, we always see ths so-called-monk smoke eh? Seeing blank spaces? I wouldn't want to add too much of things in this wall... It may seem a bit 'noisy'... He needs peace, because he always shout at Goku and Gojyo -- "SHUT UP!" a simple circles pattern from the original scan would be good as some in SZ suggested me to place some pattern to reduce its blankness... Thanks for your suggestions! I guess that all. Thanks to those who have downloaded, commented and favourted the wall. Thanks a lot! Browse Saiyuki Gallery: Recent | Popular. I really like this wall. The simplicity, colors, and bold lines. Great job! I love Sanzo! Wow, I'm in love with ur vectors. It's really clean! Clean, awesome vector. Thank you!